Greetings, dear readers! We are already in the last week of March, and that means a new Polish Pickup opening will be upon us soon! I have a few of the offerings to share with you, and for today's blog post, let's get a closer look at Hubble'd Together, the offering provided by KBShimmer! 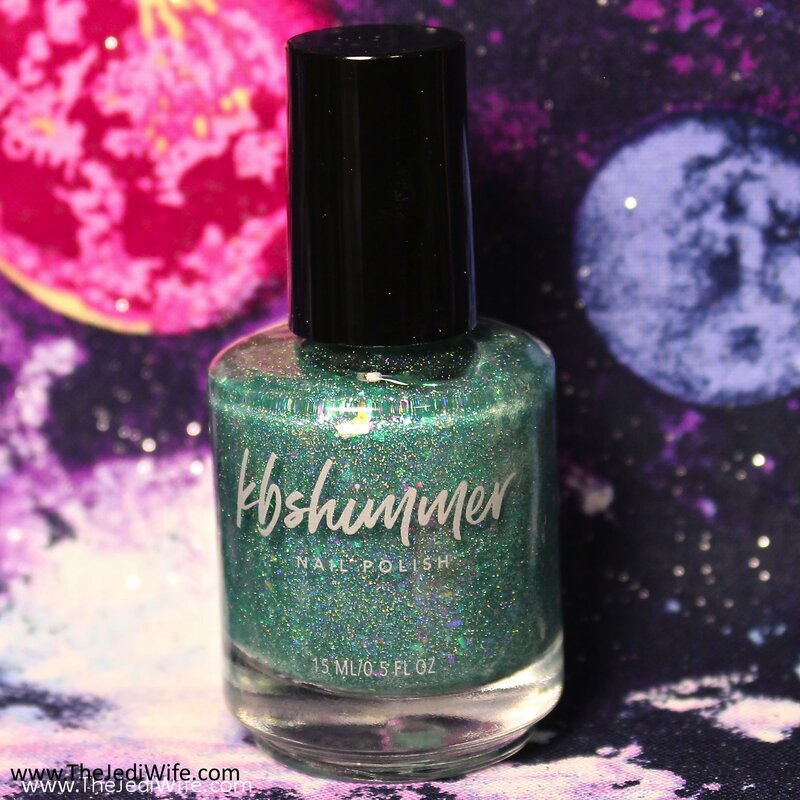 The theme for the April Polish Pickup is Planets & Galaxies, and KBShimmer selected to pay homage to the Hubble, the world's first space-base optical telescope. Hubble'd Together was inspired by a photograph taken by the Hubble of Jupiter, its three moons and their shadows. Hubble'd Together starts off with a teal leaning mint jelly base before then being loaded up wit holographic micro flakes. It is also filled with unicorn flakes to emulate the pastel shades of the inspiration photo. 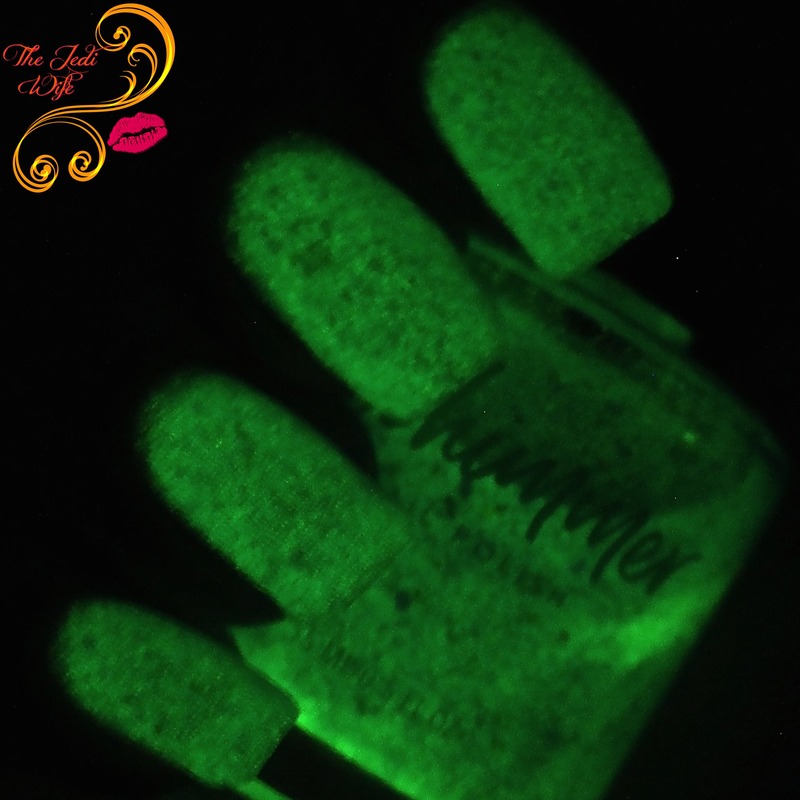 It also contains glow powder so that is glows a lovely green in the dark. 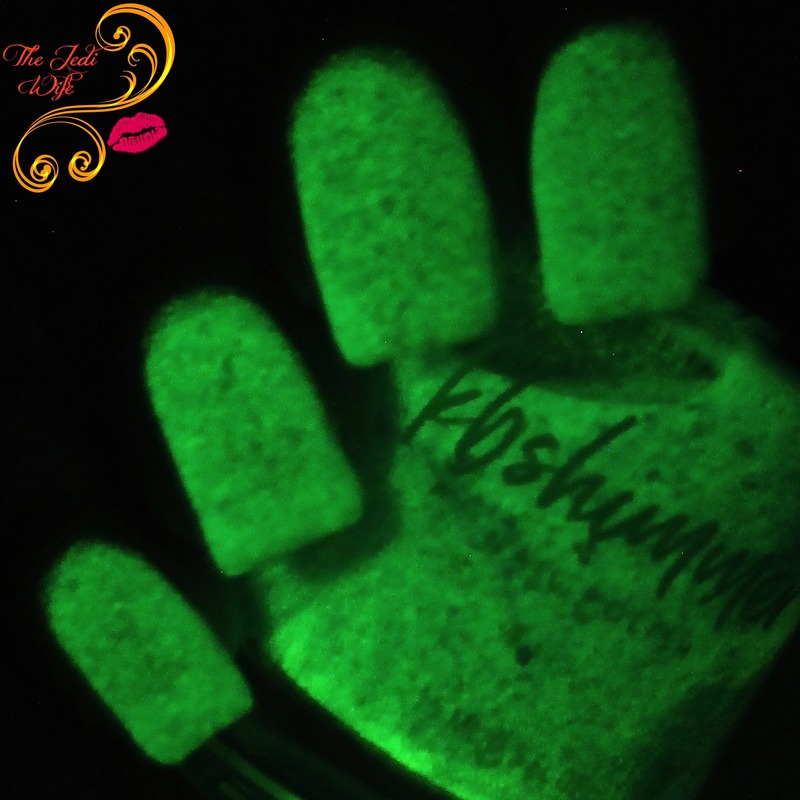 The previous photos were taken after application of three easy coats plus a coat of KBShimmer's Clearly On Top top coat. Flake-filled polishes always look so pretty and shimmery when they have a glosser top coat, but I really love the soft muted look they impart when you add matte top coat. Check it out! I love the way this polish looks with both a shiny and matte finish! I was also able to capture a few glow-in-the-dark shots as well! Check it out! 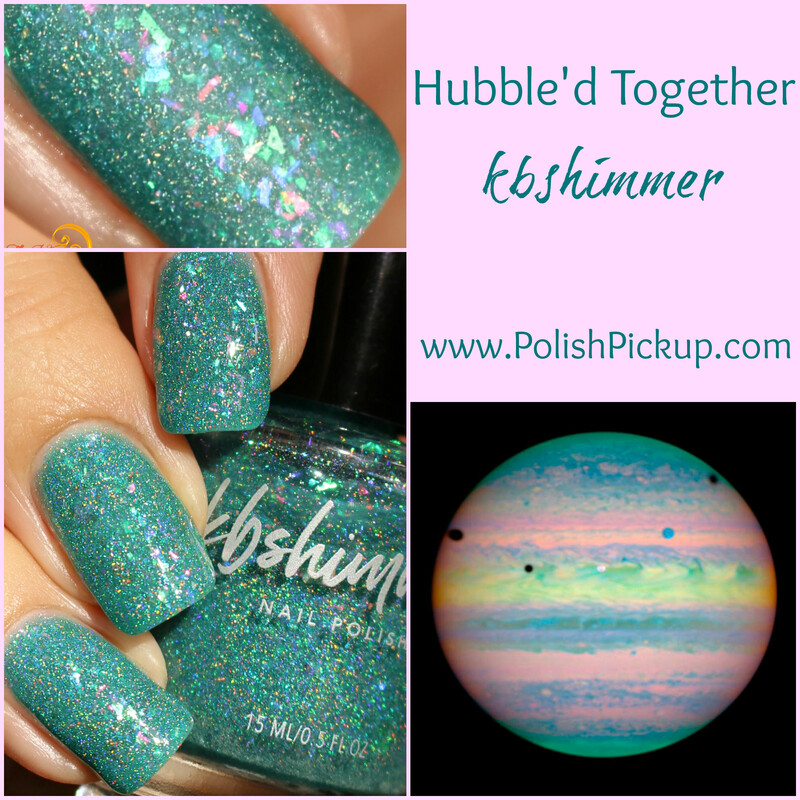 Hubble'd Together will be launching on the Polish Pickup website Friday, April 6th. As always, the Polish Pickup will only be open for a very limited time, and this polish will be available for purchase as a preorder only through April 9th. Hubble'd Together will retail for $10 per bottle. At this time, no caps have been placed on this polish so everyone has the opportunity to enjoy this beauty! I know I certainly need a backup bottle! Is Hubble'd Together on your wishlist? Do you prefer it with a shiny or matte top coat? I'd love to hear your thoughts! I love this polish!!! I can’t wait for April’s PPU I love the theme so much! Hubble'd Together is amazing, some of the flakes even look like stars! I love this polish! love the fact that it glows in the dark. And the flecks are so sparkly!!! This is so freaking gorgeous!!! Perfect for spring! The unicorn flakes are everything in this polish! This one is on my list! The matte is freaking amazing! Ooo! I really like this one matte. This polish is one of the few that look equally as neat shiny and matte!! I never thought of doing a matte with glittery polishes. I like the look! I don't think I knew what the theme was for the month since I was away. KB really picked up the essence of that picture. This is super pretty. Oh man. I love this glossy and matte! Oooh I love this with matte topcoat on it! And yay! You got glow pics! This is such a beautiful polish! I'm loving this theme! I love anything Space-themed. The matte finish makes those flakes POP! When glossy, this would make a unique background for a galaxy-ish mani. I love those flakes!!! And matte, genius!! You can see the flakes better!!! Mmm this is absolutely dreamy!! !